"The green pale in the flag symbolises Irish republicanism dating back to the Society of United Irishmen in the 1790s. The orange represents the minority who were supporters of King William III, who was of the House of Orange and originally the Stadtholder of the Netherlands, had defeated King James II and his predominantly Irish Catholic army at the Battle of the Boyne in 1690. His title came from the Principality of Orange in the south of France that had been a Protestant bastion from the 16th century. It was included in the Irish flag in an attempt to reconcile the Orange Order in Ireland with the Irish independence movement. The white in the centre signifies a lasting truce between the two cultures and a living together in peace. " Wake up! Not mind-blowingly interesting, I know, but I thought I owed you an explanation. I do love that the white represents peace between two once-conflicting parties. Anyway, this water recipe is pretty tough. Ready? Fill a clear pitcher halfway with ice. Add lots of water. 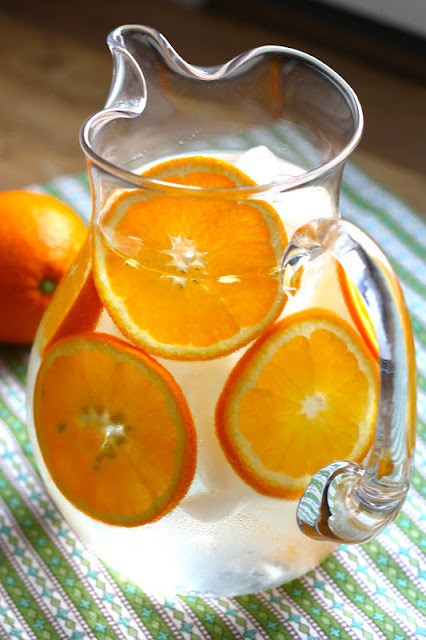 Add orange slices, arranging some between the ice and inside walls of the pitcher for looks. That's it! Honestly, it's simple touches like this that make something special. The majority of the time when when have guests over, I just serve water dressed up a bit. Refreshing and subtle flavors like fresh orange enhance rather than compete with the other flavors in the meal.